The Caledonian Chorister is a special train, taking participants from Scotland to London for the Cancer Research Festival of Brass and Voices. The Caledonian Chorister is a special train, on behalf of JAC Travel and Cancer Research UK, taking participants from Scotland to London for the Cancer Research Festival of Brass and Voices, which raises funds for the charity. Get the cheapest train tickets available between Scotland and London AND travel in First Class AND support Cancer Research UK. Train Hire has a limited number of great value train tickets available to the general public. Bag yourself a bargain return train ticket from Scotland to London, even if you’re not attending the Festival. Enjoy the collective sound of 1,500 voices from male and female voice choirs from all parts of the United Kingdom singing well-known choral repertoire, together with the world-renowned Cory and Grimethorpe Colliery Brass bands, and of course the equally-famous Royal Albert Hall organ. These Festivals, organised entirely by a committee of volunteers, are run every three years and all monies raised are donated to Cancer Research UK.' And here's some more information for those planning on taking part in the festival. Train Hire is part of Train Chartering, which has provided charter trains, private rail cars and special rail travel since 1998 to corporate and individual clients as well as group travel organisers. JacTravel is one of the world's premier suppliers of online hotel bookings and inbound travel services to the tourism sector. With over 35 years specialist experience, JacTravel offers a wide range of group and FIT services as well as an online booking system for industry professionals. 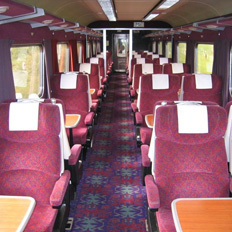 Trainhire.co.uk, the low-cost option for rail charters and booking large group travel, offers high capacity trains for hire across the entire British rail network. Train Hire arranged group travel for employees of a leading High Street restaurant chain who were being rewarded for outstanding performance.